Do you have a corporate function or event that requires a professional and entertaining MC or comedian? Gavin Baskerville is the all in one solution. Dress him up or dress him down, Gavin is the perfect performer for all occasions. Gavin can even tailor a comedy performance to your needs, writing custom material to make your event hilarious and unique. With over ten years experience as an MC and comedian, coupled with a background in corporate event staging and management, Gavin will provide an energetic, fun and intelligent flow to your event and ensure its overall success. 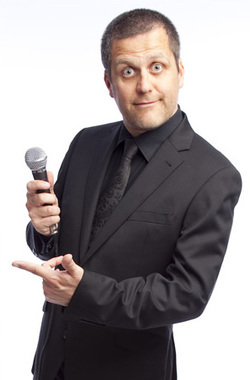 Gavin also runs corporate stand-up comedy workshops that teach communication and presentation skills. "We had a great experience working with Gavin as he facilitated a corporate workshop for our 22 staff over two days. He tailored his program to suit our needs. Our staff gained new skills in conceptualising, preparing and delivering presentations that will be valuable to all communication efforts of our organisation. Thanks Gavin."